Are you in an exercise rut? There’s no better time than summer to switch up your routine and take your activity outdoors. You need no equipment other than your creativity and a sense of adventure! Ready to get moving? Below are some sample routines you can try outdoors. Make sure you properly warm up and cool down for your workouts. Find a good-length hill or stairs for this routine. If you live in Pittsburgh, chances are there will be a hill or set of stairs nearby. 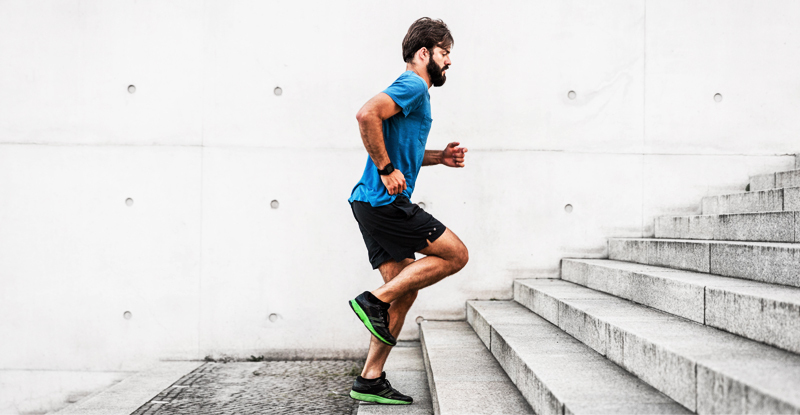 Run/sprint a good-length hill or stairs for about 30-45 seconds. At the top of the hill, complete 10-15 body squats and then jog down the hill as recovery. At the bottom of the hill, complete 10-15 pushups. At the top of the hill, complete 20 alternating lunges, either forward or backward. Jog down the hill and recover for 30 to 60 seconds. Repeat 3 to 5 times, depending on your fitness level. Remember to start slowly and work your way up to increased numbers of sets and repetitions. If you are ever running along one of the river trails in the city or a local park, you may find benches or sturdy elevated platforms you can use for some of the strength-training exercises. Try this routine along those trails. Run or jog to the nearest bench or sturdy and safe platform. Complete 10-15 step-ups on the bench or sturdy and safe platform. Run or jog to the next bench or sturdy and safe platform. Repeat 3 to 5 times through, depending on how far you would like to run. Be creative and mix and match different exercises. Just make sure you are performing the exercises with proper form and technique, and also remember to warm up and cool down.